A breakthrough instrument, the Model 5265 SGSA simultaneously measures both a slurry’s compressive strength development and its static gel strength development while it is cured under downhole temperature and pressure conditions. Similar to a standard ultrasonic cement analyzer, the cement’s properties are inferred by measuring the change in the energy level of an ultrasonic signal transmitted through the cement specimen as it cures. 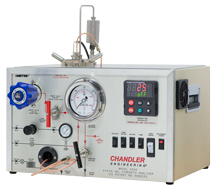 Proven through actual laboratory testing, the proprietary algorithms developed by Chandler Engineering for static gel strength measurement are applicable to a wide range of cement slurry densities and compositions including light weight, heavy weight and latex slurries. The cement slurry to be tested is prepared in accordance with API recommendations, then placed in the unit’s temperature and pressure-controlled cell which simulates the curing conditions that are expected downhole. During testing, temperature is automatically controlled while pressure is manually set. Further enhancing the performance and repeatability of the 5265 SGSA is our Quizix Model Q5220 pump. This is an optional item and when included with the 5265 SGSA, greatly improves the pressure control characteristics of the system. By adding the Quizix Model Q5220 precision pump, pressure is accurately controlled within +/- 25 psi. This reduces the risk of a pressure transient aff ecting the structure of the gel during the critical gel phase of the slurry under test. Chandler Engineering highly recommends the addition of the Quizix Model Q5220 for any 5265 SGSA installation. The acoustic measurements are read by a unique system of sensors and electronics which automatically perform the complex calculations. All test data and results are then transferred to a computer that is running the Chandler Engineering Model 5270 Data Acquisition software. The software produces real-time graphs of the test results which can be printed at any point during the testing.